Schematic of a VCSEL in a cross-sectional view. This project focuses on the research and development of highly energy efficient and highly temperature stable vertical-cavity surface-emitting lasers (VCSELs) and nanometer-scale VCSELs for near-term and future applications in data communications, illumination, and sensing. 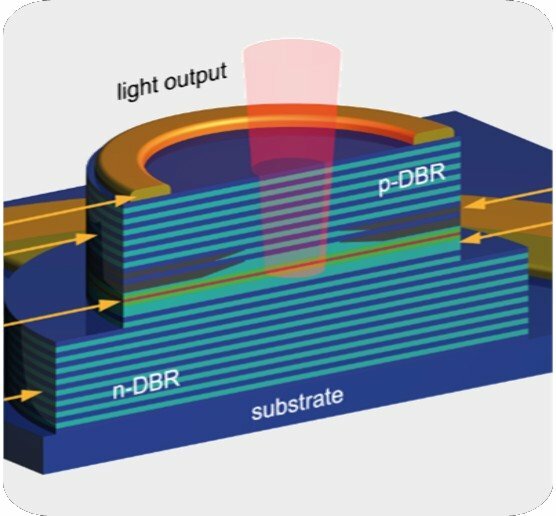 Furthermore, we aim to develop VCSELs with the highest possible modulation bandwidth and VCSELs that are suitable for integration onto silicon materials and circuits to enable future silicon photonics systems. We also develop nanolasers with the minimum possible volume and thus the highest possible bandwidth density. German Research Foundation within the Collaborative Research Center 787 "Semiconductor Nanophotonics: Materials, Models, Devices".